George Dobler helps unload the donations delivery for the Northport Veterans Affairs Medical Center. COMMACK — CSEA’s Long Island Region Veterans Committee is always making an effort to give back to area veterans. The committee has been accepting donations of personal care items and food for veterans who are residing at or using services at organizations such as the Northport Veterans Affairs Medical Center, the Long Island State Veterans Home, Boots on the Ground and The Veterans Place. 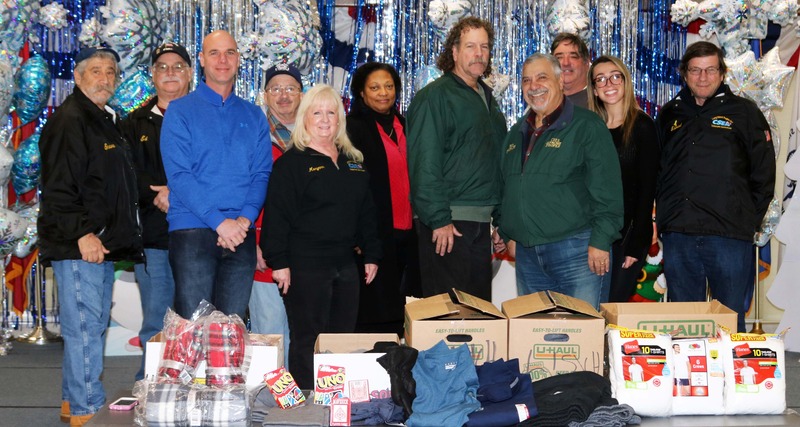 All of the CSEA member donated goods, which include games, clothing and gloves, were recently delivered by Long Island Region Veterans Committee members and other volunteers to the various facilities. The Long Island Region Veterans Committee and volunteers proudly display a few donated items at the Long Island State Veterans Home. From left, Steve Abramson, Ed Hussey, Kevin Norwood, Allen Phelps, Long Island Region Veterans Committee Chair Maryann Phelps, Evelyn McFarland, George Dobler, Long Island Region President Nick LaMorte, J.J. Kremm, Catherine T. Kremm and Edward Pluchino. Ed Hussey and Long Island Region Veterans Committee Chair Maryann Phelps collect food donations at the Nassau Educational Local 865 Annual School District Career Conference. Evelyn McFarland carries boxes of donated items. J.J. Kremm, Long Island Region President Nick LaMorte and Allen Phelps deliver donated wares to the Long Island State Veterans Home.